The Youth Ventures Joint Powers Authority (JPA) is a partnership amongst the City of Oakland, County of Alameda, the Oakland Unified School District, First 5 Alameda County, Alameda County Office of Education, and the Peralta Community College District. This body combines and coordinates efforts by securing and leveraging resources and decision making powers to improve outcomes for broadly challenged families, children and youth. The JPA is subject to the Ralph M. Brown Act. The Youth Ventures Joint Powers Authority (JPA) advocates for children, youth and families in the City of Oakland with a special emphasis on populations experiencing great disparities. The children, youth and families in Oakland are the healthiest in the nation. The JPA collaboration was sparked in 1998 in Oakland, California as one of only five sites across the country selected to participate in the national Urban Health Initiative of the Robert Wood Johnson Foundation. The ten-year initiative sought to make system-wide changes to sustain improvements in the overall health of children living in urban areas. In Oakland, this collaboration took shape in the form of Safe Passages and its work focused on alleviating the effects of violence on children and youth from birth to early adulthood. 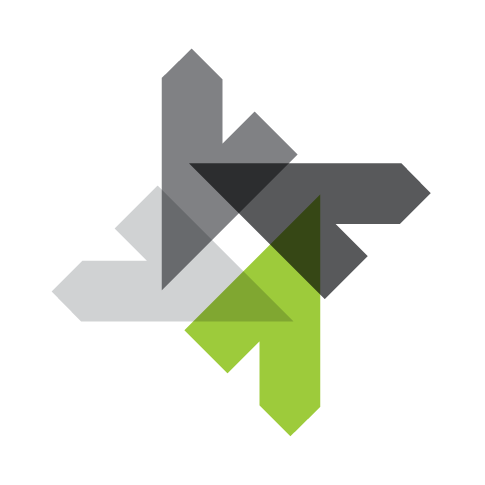 Three major public entities developed and implemented far-reaching systems change efforts during this period: the City of Oakland, the County of Alameda, and the Oakland Unified School District. The Safe Passages Board of Directors was a configuration of elected officials including county board of supervisors, city council members, and school board trustees, as well as high-level administrative directors, including the chief of police, chief of probation, director of social services, and director of health care services, among others. In addition, the district attorney and juvenile court judges participated in the development and implementation of cross-jurisdictional initiatives to create alternatives to incarceration and reduce recidivism among repeat youth offenders. Today, Safe Passages operates as a 501(c)(3) nonprofit with a variety of governmental and philanthropic partners and provides programs in early childhood, school-based services, juvenile justice, and urban arts. Given the report, the Board requested that staff focus on two governmental structures: Joint Powers Authority and State Legislated Special Authority. The process undertaken to investigate these two primary methods to create independent governmental entities included approximately 40 interviews, consultation with experts and other agency authorities, detailed research, and legislative analysis. Both the Joint Powers Authority and the State Legislated Special Authority (Special Authority) models were analyzed to determine compatibility with the adopted core principles and functions of the proposed entity. Additional research was conducted to identify existing JPAs and Special Authorities created to provide services for children, youth, and families. Investigation into specific organizations was conducted to determine the organizational and voting structures, budget information, and the Brown Act requirements. In July 2006, the Board of Safe Passages adopted a draft Joint Powers Authority Agreement to institutionalize the decade long partnership. In addition, the board also directed staff to create a non-profit, 501(c)(3) arm for the partnership in order to increase flexibility and capacity for development and organizational options. The JPA Agreement was then forwarded to the governing bodies of the three chartering members: County of Alameda, City of Oakland and Oakland Unified School District. The Oakland City Council adopted the Agreement via Resolution on July 25, 2006. Similarly, the Board of Supervisors for the County of Alameda adopted the Agreement via Resolution on September 26, 2006. Finally, the Oakland Unified School District, adopted the JPA Agreement on December 13, 2006. The following year in March 2007, the San Lorenzo Unified School District requested admission in the JPA. The Youth Ventures Joint Powers Authority Board of Trustees granted San Lorenzo Unified School District admission at their September 2007 meeting. In 2015 JPA Trustees moved to amend their focus to target youth and families in the City of Oakland. With the change of regional focus, San Lorenzo Unified School District decided to resign from the Board. The board approved membership of Alameda County Office of Education, First 5 Alameda County, and Peralta Community College District, and these members joined the board in 2016. 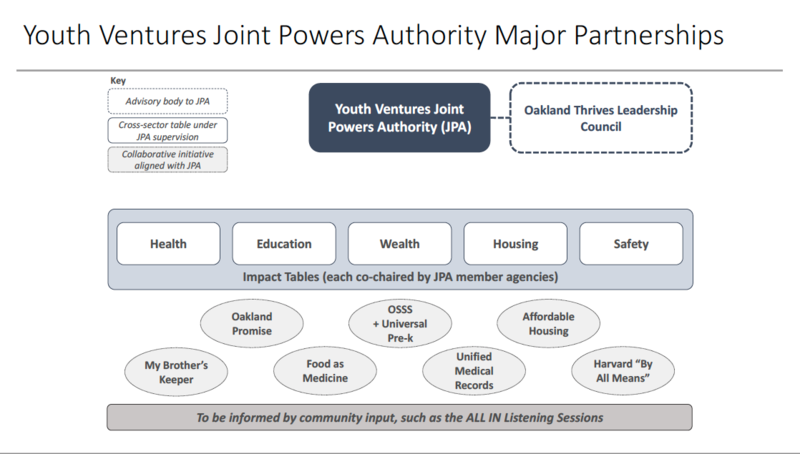 The Youth Ventures JPA remains open to all public systems in the City of Oakland seeking to enter into this multi-governmental partnership with the intent of furthering their jurisdictions’ commitment to integrated services for vulnerable populations. Our partners and service providers include the governing body, funders, partners and community providers. The Youth Ventures Joint Powers Authority is fiscally sponsored by the Marcus Foster Education Institute.